January Dragon Biscornu [C5231] - $6.00 : Yarn Tree, Your wholesale source for cross stitch supplies. Cross stitch pattern from Tiny Modernist. Their fiery breath, flapping wings & pointy spikes...lookout for the big, green dragons! 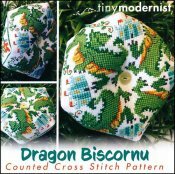 Blue castles & green dragons are stitched throughout this newest biscornu from Tiny Modernist. Stitch count is 71H x 71W.